On July 23, 2016, the United Kingdom voted on a referendum to leave the European Union. Known officially as the “United Kingdom European Union membership referendum,” it is commonly abbreviated to Brexit. Roger Scruton decries “the emergence of the European Union as an imperial power,” on the first page of Fools, Frauds and Firebrands: Thinkers of the New Left. 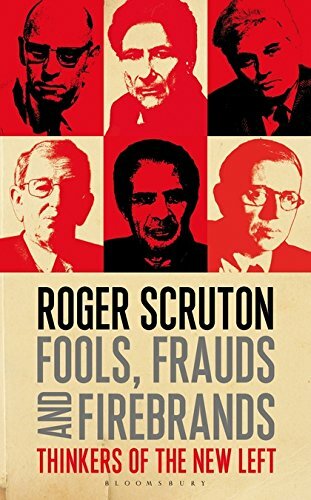 Fools, Frauds and Firebrands is a reworking of Scruton’s 1985 book Thinkers of the New Left. While Scruton possesses a fearsome intelligence, acid wit, and moral passion, Fools comes across as a bizarre centaur of a book. But for those left of Attila the Hun, to borrow a hoary cliché, Fools can be a useful tool for “oppo research.” This is what the Right thinks the Left is all about. The problems with Scruton’s analysis revolve around the two interrelated issues of the book’s title and its scope. Scruton is no stranger to drama and verbal bombast. He can make critiques of otherwise dull and/or incomprehensible theorists interesting and fun to read. The first issue is with the title of the book. More precisely its subtitle, Thinkers of the New Left. He lumps everyone from E. P. Thompson to Slavoj Žižek as a member of the New Left. This dovetails into who he includes to critique. These include philosophers, historians, law professors, and psychologists. The sole criterion for inclusion often ends up being membership in the Communist Party or leftist sympathies. These factors, coupled with its integration of material from 1985 to newer 2015 material, creates an overall muddled effect. The overall tone is one of post-Cold War triumphalism shot through with anticommunist paranoia. The Berlin Wall may have fell, but every university professor is suspect as a potential communist in hiding. These professors are ready to seduce the innocent with such terms like “social justice” and “bourgeois.” Despite his erudition, Scruton can come across as a curmudgeonly crank. The broad scope and bombastic title don’t necessarily detract from its overall thesis. Scruton nails down the dangers of the New Left, including the adoption of “Newspeak.” “As a result Newspeak developed its own special syntax, which—while closely related to the syntax deployed in ordinary descriptions—carefully avoids any encounter with reality or any exposure to the logic of rational thought.” The Leftists he critiques use language to obfuscate, bewilder, and mesmerize. Jacques Lacan and Slavoj Žižek become the biggest targets. Scruton has a magisterial summary and analysis of Jean-Paul Sartre’s magnum opus Being and Nothingness. Despite his obvious disagreements with Sartre’s existential (and godless) philosophy, he made it easy for a general audience to understand. The otherwise stately discussion of existential ends on a sour note: “What is remarkable in Sartre’s later writing—at least in that is taken up in the jihād of ‘commitment’—is the copious flow of ‘totalizing’ Newspeak.” Scruton wastes an opportunity to dissect Sartre’s philosophical commitment to freedom with his notorious loyalty to Stalinist Communism. Whereas the critique of Sartre is magisterial and concise, Scruton’s critique of Michel Foucault is an extended exercise in being ideologically tone deaf. Scruton simply can’t understand why Foucault would find social institutions oppressive. Scruton may be a polymath and philosopher, but he lacks the empathetic intelligence to walk a mile in Foucault’s shoes. While it would be amusing to offer counter-arguments to every dunderheaded assertion and broad-brush generalization in the Scruton repertoire, this review simply lacks the space. The end result is a catalog of bad faith. He criticizes leftists of various stripes for lacking the moral and intellectual conviction to develop into a conservative. In the end Scruton sees himself as a holy crusader, the last knight fighting a futile battle against the hydra of secularism, multiculturalism, and moral relativism. Like Pat Buchanan, he is a paleo-conservative speaking out of both sides of his mouth. He sees conservatism as “a politics of custom, compromise and settled indecision. . . . Extremists within the conservative alliance, therefore, are isolated, eccentric, and even dangerous.” That might have been true in 2015, but today conservative extremism has become the norm. Scruton is the last conservative dinosaur, a creature ill-adapted to the modern vagaries of the global alt-right. Fools, Frauds and Firebrands: Thinkers of the New Left is a no-holds-barred take-down of the modern Left. Scruton pulls no punches and pierces the veil of academic shibboleths and oppressive groupthink. But it is naïve to believe shibboleths and groupthink is the sole province of the Left. The Right and the Left are different herds with different outdated rituals and tarnished idols. In the end Scruton presents himself as an unreconstructed Thatcherite waging battle against unreconstructed Marxists. To him, this is the most pressing conflict of the day. Today it may be seen in another light: as a dinosaur exhibit.